Easily add or remove weights to create a personalized program. 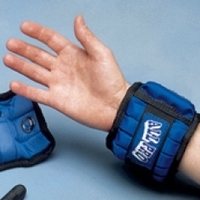 Contoured foam provides comfort and permits free wrist and hand movement. Remove or add weights as needed. Each weight is 1/5 lb. (.07kg). Secures with hook and loop fasteners.